You are welcome to use/reprint our texts and photos with credit and/or a link back to Paul McNulty fortepianos. Conrad Graf, (1782–1851), who held from 1824 the title of „Imperial Royal Court Fortepiano Maker (“k. k. Hofpiano und Claviermacher”), was born in Riedlingen (Wurttemberg) and came to Vienna in 1799 as a joiner. 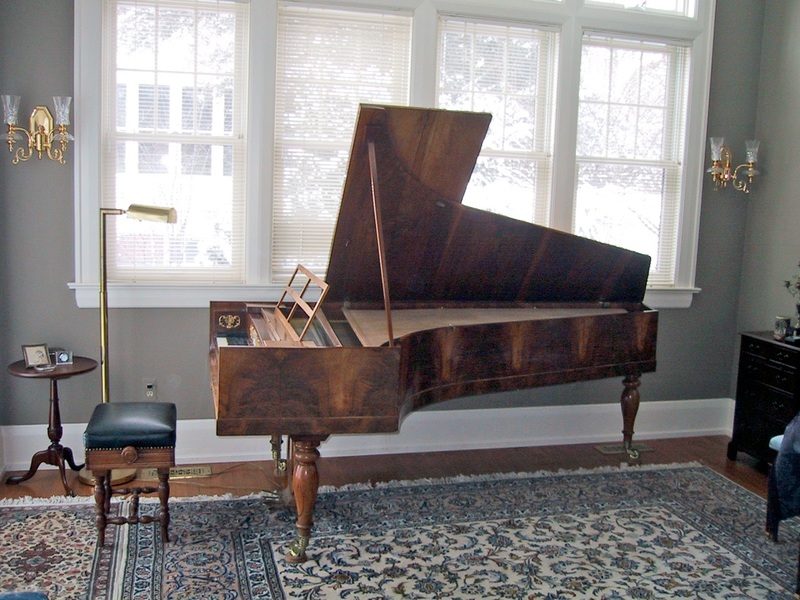 He became a piano builder and opened his own workshop in 1807. By 1820 his instruments were considered “the greatest and most renowned in Vienna and throughout the empire.” Graf not only supplied instruments to all the apartments of the imperial court, but also provided a pianoforte for Ludwig van Beethoven in 1825. When in 1822 Graf copied Broadwood in doubling his soundboard thickness, he left the classic Viennese sound world behind and became more romantic in timbre. The hammers were enlarged in proportion, but the pedals stayed the same: moderator, double moderator, sustaining and una corda. This soundboard pattern continued unchanged from 1822 to 1840, proving the builder’s satisfaction with this design, a feeling shared by many composers. This opinion was supported by Chopin, who wrote back home from Vienna that for his concert he preferred to use a Graf, as most musicians considered him to be the best maker in Vienna. Similarly, Robert and Clara Schumann, Liszt and Mendelssohn held Graf pianos in the highest esteem.